By now you probably have a good system for homework and studying down, but as the semester goes on, it's harder to maintain and you might end up doing homework later and later at night. I've found that I always started the semesters out strong and got work done the day they were assigned, but as the weeks progressed, I slacked off more, resulting in me staying up for hours into the night to finish schoolwork. 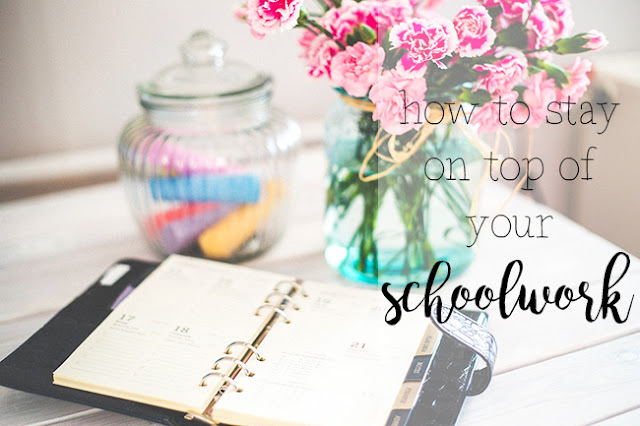 I know a lot of students face the same predicament, so I made a list of tips for any student who finds they're struggling to keep up with schoolwork. I personally found number 4 to be very helpful when I was in college! 1. Color code! Hopefully by now you've written all the major assignments, quizzes, tests, midterms/finals, etc of all your classes in your planner. If you haven't, do it now, and color code it! I'm reverting back to the elementary school days where you had a different colored folder for each class (math was always red, wasn't it? ), but it honestly works! Assigning a different color to each of your classes helps you visualize how busy your week or month will be. 2. Take advantage of spare time now and again. If you find yourself having an extra 30 minutes between classes, get started on homework so there's less stuff for you to do later. If you just came from class, you'll already be in the mindset to do work. Lunch plans fall through? Grab a lunch for yourself and go to the library to do work, or work outside if it's nice enough. Good weather can put you in a good mood! 3. Work in increments. If you have a lot to do, setting increments can help so you don't feel bogged down by one subject. For example, spend one hour on English homework, one hour on History, etc., or break it up by chapters--whatever marks good starting and stopping points. If you spend several hours on one subject, you might end up feeling bored, confused, frustrated, or tired, so it's nice to bounce around from subject to subject. 4. Write out a weekly schedule and stick it where you will see it. Put it on a whiteboard and hang it at your desk or keep a note on your computer so you see it every time you open it. Write up what you have going on that week in regards to school, your social life, and work (and color code that, too!) so you can easily schedule your time. I did this while in college and it really helped me figure out how to break up my time depending on how much work I had. 5. Don't do homework or study on your bed. I feel like everyone knows this, but it's important to reiterate because I still found myself doing homework on my bed at school. Even though your bed is comfortable and seems like a good place to do schoolwork, it actually doesn't help. It'll lead you to feeling tired, lazy, and just wanting to nap. Keep your relaxing and study spaces separate so you'll be less inclined to slack off and be less stressed! Everyone has their different ways on how they tackle schoolwork, but hopefully these will give you some new ideas if you find yourself struggling to stay on top of everything. Let me know in the comments what you do/did to keep yourself focused on homework! Quote of the day: "Start somewhere."